Apps and toolkits provide passive support, and quick management systems, to make the process as easy as possible for everyday champions to deliver at scale. Our ‘Energy Credit’ tracks savings delivered by people and teams. Trackers, incentives and rewards are often key ingredients to ensure effective continual improvement is delivered at scale. 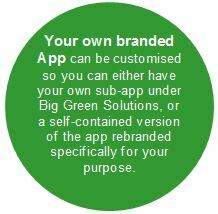 Big Green Solutions is our generic App that can provide support. In its simplest form, it’s an ideas App that raises awareness for colleagues and allows them to contribute ideas for improvements, give feedback and track progress. With its more advanced features, this App offers training and toolkits for everyday sustainability champions and energy users to help energise change. Makes it quick – even if you are one of the busiest people you know, you do have time if you spend just 20 minutes a day using the app. Gives users the knowledge – it includes awareness, training, actions and plans to guide everyday champions through simple gamification. It makes it yours – over time you can tailor-make the approach and your own game as you track and learn from your success. Additional tools can be customised for your organisation, as required.